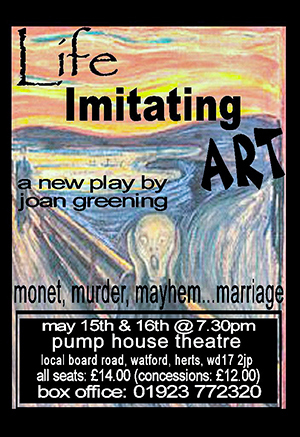 Life Imitating Art advertisement poster. Pete is on the run. He hides in the Post-Modern room of an art gallery where Dorothy mistakes him for her private guide. They bare their souls and discover their weaknesses whilst exploring the extraordinary works of art. How meaningful is a pile of rubbish? The encounter is both hilarious and emotional.